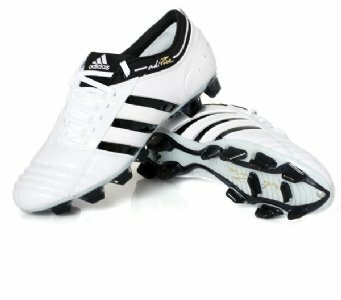 The Adidas AdiPure II Firm Ground (FG) Football Boots White/Black/Gold are the very latest release in the now well renowned AdiPure family of boots. Made from the very finest K Leather which is soft and supple and moulds itself to the players foot if looked after properly.The sole plate of the AdiPure II boot features TRX non removeable traxion studs that are ideally suitable for soft ground surfaces. A new feature of the AdiPure II is the wrap around combined tongue and ankle support of the boot.The additional padding gives more comfort to the player and the new off centre lacing leaves plenty of area to get a clean contact of the ball in the instep and toe box. 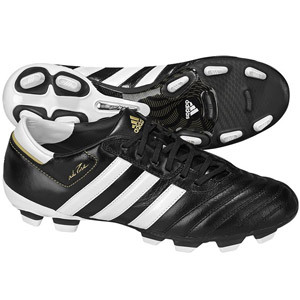 The handcrafted boots give a glove like fit and the softness of the k leather upper gives optimum feel for the ball in all conditions.This great looking boot also has the famous 3 stripes that are stitched in and embedded and show the adipure logo on the outside collar of the boot as well as the adipure heel tab.Also available as soft ground outsole option.